While it’s generally not the most rewarding program for US residents, many TPG readers took advantage of Air Berlin’s offer of four free months of Air Berlin Silver (Oneworld Ruby) status. 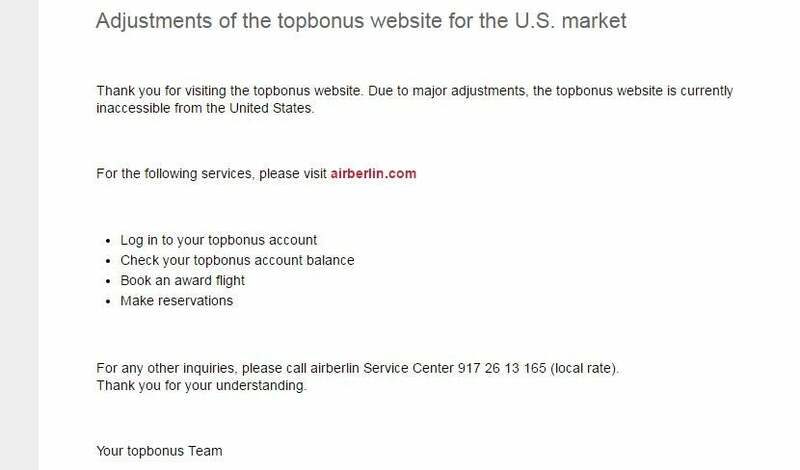 Since we are just one month into this generous promotional period, we’d be disappointed if Air Berlin suddenly pulled the plug on the entire TopBonus program now. So, we immediately reached out to Air Berlin for comment. To reduce confusion, Air Berlin has now added this error message when you try to log in from the US. The seemingly-overworked media team eventually got back to us with an explanation of the situation. The good news is that TopBonus program is not being eliminated; there’s just a website update that’s taking a very long time to complete. Until it’s complete — which is expected to be in “mid-February 2017” — US-based members won’t be able to use the TopBonus website. The topbonus website hosted under the domain name topbonus.airberlin.com is currently being revised and adapted to meet the requirements of the new US Web Content Accessibility Guidelines (improved accessibility and usability for people with disabilities). US citizens will continue to be able to participate in the general topbonus programme during this time. However, until topbonus can ensure that the website complies with the new accessibility guidelines issued by the US Department of Transportation, use of the topbonus website will be temporarily (from 9 December 2016 until approximately mid-February 2017) unavailable to visitors from the United States. As soon as the necessary adjustments are completed, the website will once again be available to US citizens. During the outage, the best way to access your account features will be to browse to Air Berlin’s English homepage and log in at the top right corner. From there, you can view your mileage balance, view your progress toward elite status, select “My bookings” to view any upcoming Air Berlin bookings or “Book an award flight” to use your miles on a flight. For now, the “My profile” and “Change password” links will send you to the error page. Another work-around: logging into the Air Berlin TopBonus account from another country. The block seems to be based solely on your IP address, rather than the country listed in your account profile. I was able to log into my TopBonus account with no trouble using an international IP address. If you want full access to all of the website’s features, you can use a VPN connection to log in from another country. While we’re disappointed that a website update is taking so long, we’re happy to get confirmation that the TopBonus program isn’t being eliminated entirely. If you need to access your TopBonus accounts during the extended downtime, you can access some features by logging in from the Air Berlin’s English homepage. For full access, you’ll need to log in from outside the US.